The four artists of this group show epitomize the two polar opposites of the tangible and the divine. Or do they? 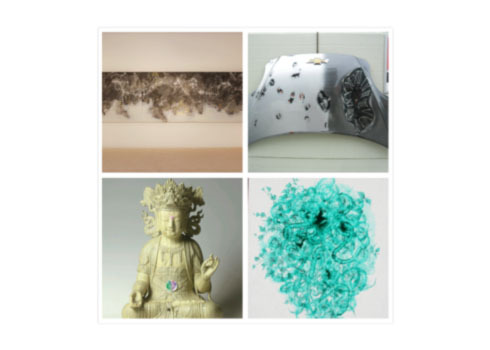 Ostensibly, their works address issues of consumerism, or spirituality, cosmic order, and multidimensional space but upon closer inspection they embody all these and more. Sunny Kim creates abstractions entitled Cosmic Dreams because she is drawn to the vastness of the universe, endeavoring to find what lies underneath. Her abstractions loosely reference the cosmic realm and its heavenly bodies resulting in celestial patterns that can be read as both chaos and order. Kim explores the universe through the art-making process while trying to overcome the limits and static qualities of the canvas to reach beyond to its underlying message and dynamism. Kim’s relentless passion evinces itself in the vastness ambitious canvasses with which he explores his emotions as part of the cosmos. Hongseok Kang’s pieces are constructed with telephone book pages that have been cut to form sculptures that appear like spiritual figures such as the Buddha or a Guanyin. The dichotomy in his works of the juxtaposition between the material (telephone books) and the divine (the Buddha) results in critically viable works that are not just showing the religious figure but rather, are critiquing common traditional beliefs. Kang challenges appearances through his use of the printed page containing many peoples’ physical addresses while also probably sending us a message that the heavenly entity is comprised of myriad peoples’ souls. The spirit is manifested in the physical form of Kang’s paper Buddha. Seongkyoo Jeon also examines cosmic issues doing so through science while basing his quest on faith. Jeon seeks the hidden truths behind appearances seeking the connection between natural phenomena and human existence. In his statement he says that “he realized recently that particle movement in quantum physics is related to human consciousness through the ‘observer effect’ and ‘string theory’.” Consequently, his faith has driven him to find answers for his creativity even in science as depicted in his abstractions that express dimensional space through the intersecting of the visible and transparent. Contrasting the vastness of the universe with the smallness of a particle, Jeon’s title Groping for the Hidden Passage best expresses his goalsfor it is while searching that we find the most meaning. Sukjun Joung’s works incorporate automobile hoods with reflections of clocks or 100 dollar bills. They appear to be about consumerism and commodification but since these objects are reflected on the car hoods, they also refer to other dimensions and an alternative time. The clocks are distorted by their refraction appearing almost like the time pieces in Dali’s Persistence of Time while the auto parts are reminiscent of John Chamberlain’s work. But, Joung remakes his pieces to accord with contemporary currents that should be read in relation to today’s concerns; time and money. The Chevrolet is a commodity that is bought with money but earning money usually means a lessening of an individual’s time and as a result the lessening of the object’s use. Joung thus exposes the dichotomies of human endeavor to own things as well as pointing out the futility of human desire.